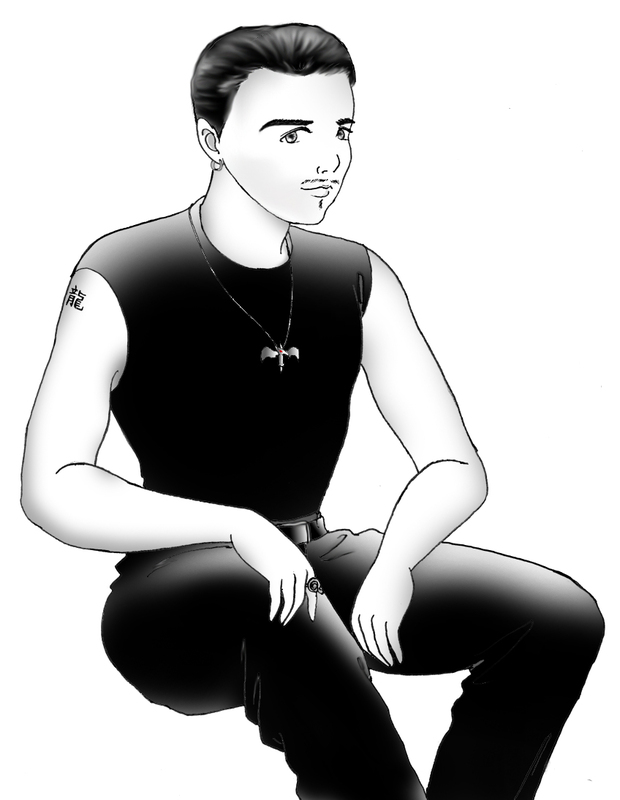 [Anime Mike]--This is an anime version of a my very cool friend Mike. I had broken all my principles when I was doing this drawing. I generally don't do free drawings on request (partly because nobody has ever requested :p), because drawing under pressure is a pain. My guys are usually skinny, very girlish/intellectual looking (because I can't draw guys :p), absolutely no earrings and other jewelries, absolutely no mustaches, and with hair that's not so neat. As you can see on this one that he's got everything I usually won't draw, I even added a tattoo for him (means "dragon" in Chinese, Japanese and maybe in Korean, if they still use Chinese characters), which Mike hasn't got one so far. Well, in conclusion, this drawing beats the crap out of every anime drawing of guys I had ever done. This is one of my personal favorites.